The huge, 12,000 square meter Bunnings hardware store, costing $23m and employing a staff of 75, was officially opened on the North Stuart Highway this morning as a beacon of faith in the future of Alice Springs. The chain’s 212th store in the nation, the third in the NT, promised to revolutionise shopping in The Centre, bringing into town many lines not available locally before, lessening the incentive to buy on-line and providing stiff competition for some existing businesses. 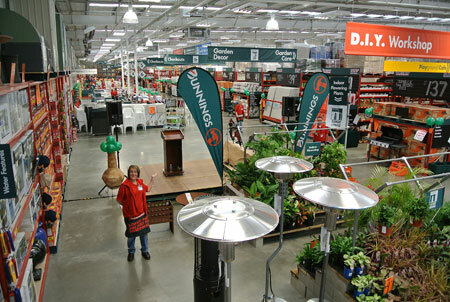 They will need to find their niche, says Clive Duncan, Bunnings’ director for merchandising and store development. 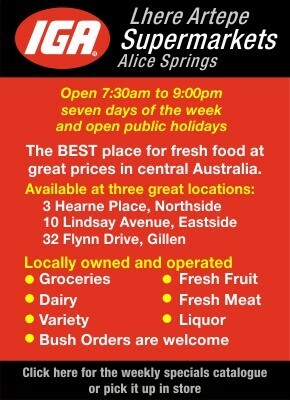 He doesn’t see the current economic downturn of Alice Springs as a problem: “Our development is based on long term,” says Mr Duncan, who performed the opening not in a pin-striped suit but in the store’s staff uniform – red top and green apron. “All towns go through their ups and downs. We see a lot of potential here. 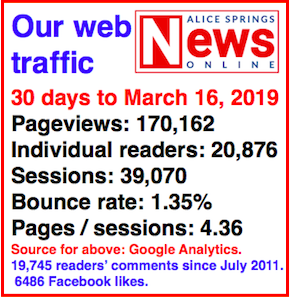 There is the right number of people, and Alice Springs has growth opportunities. Are the existing hardware stores going to get a hammering a giant like Bunnings? “There is a lot of talk about what Bunnings does to other operators, but there is a lot of room, and many businesses find their position. If they are good operators they survive. Mr Duncan (pictured) says these goods – including some that would be bought online – would make up “close to half” the store’s stock, including garden decor and playground equipment. He says reservations about “money going out of town” of course applies to the other stores as well. After all “not much product is manufactured here”. The $3m a year in staff wages certainly is staying here, and Mr Duncan is making a big point about support for community groups and the staff’s involvement with them – such as setting up a veggie garden for a school. Profits of Westfarmers will be announced in August. The parent company also owns Coles, Kmart, Target and OfficeWorks. PICTURED at top is manager Annmarie Beech. The article states the 75 people will be employed bringing in 3 million. Could some one do the maths please? So when the two existing hardware stores close how many staff will lose their jobs at what dollar cost to the town? Just asking. Good point, and I doubt that Bunnings will reverse the trend to online sales. 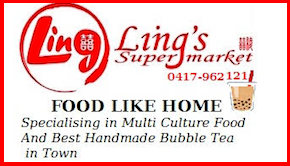 My buying decision is based on buy local if no more than 20% dearer than online inc postage. So the online cost of my local hobby purchase is $12 inc postage, old hardware store $23 and Bunnings $20. Now let’s see how the other hardware stores go. From what the eastern states have experienced, Bunnings has significantly reduced the amount of the smaller hardware chains across the board. The most interesting thing to point out is, the “We will beat a competitor by 10%” provides the idea of you assume they are cheaper, but this is not always the case. 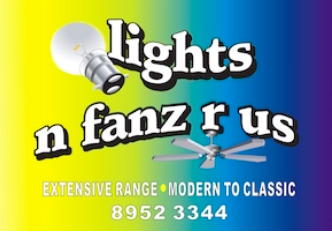 I mean they (Bunnings) can sometimes be more pricey, so it’s best to shop around first beforehand and get it right otherwise you may find you’re paying more at Bunnings. 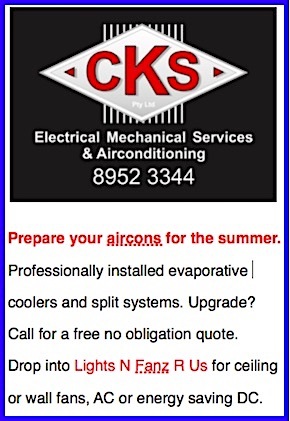 Shop around first and you can get the 10% cheaper cost or better still consider the local guy, don’t drive all the way up the road to Bunnings just to save on costs. It may be only another two or three kilometers away from town but eventually the smaller hardware joints will pack up and move on.